[Confession.] Some traditions have made a “sacrament” out of it. By the word “sacrament” is meant an act that serves as a direct channel of God’s grace. However, many have sought to expand that number, and to even make them serve in ways the Bible never teaches. Requiring them of people in order to be right with the Church and with God. So it is some see confession as something the Church, or a Priest acting on behalf of the Church administers. But that is not all how we understand confession Biblically. Confession as it is taught in the Scripture is simply a part – albeit a vital part – first and foremost of the individual’s relationship to God – having once been united to Him in Christ by the Spirit. So it is, Jesus can teach in the model of prayer He taught His disciples – that “forgive us our debts, as we also forgive our debtors” is part and parcel of the normal Christian prayer life. 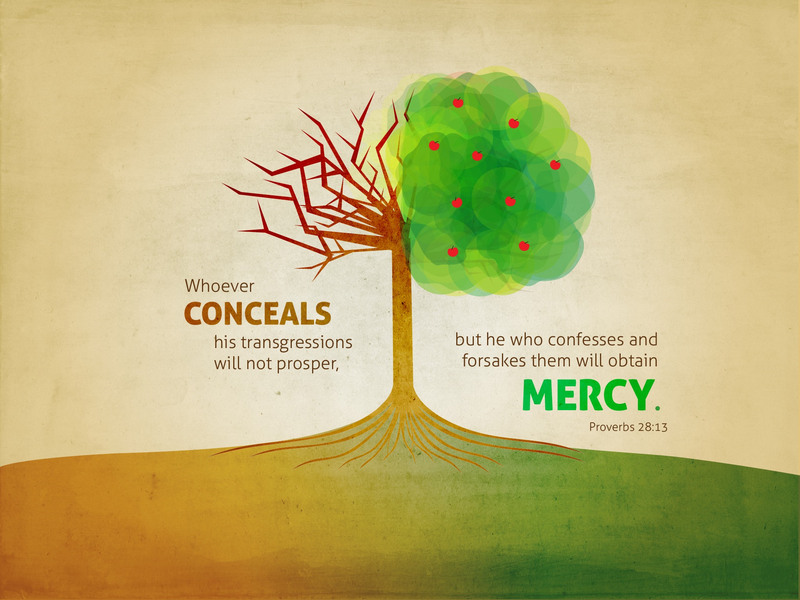 That said, we can see in 28:13 that in the first place: CONFESSION no doubt refers to oneself. If we conceal our transgressions from ourselves, or seek to deny their real sinfulness or egregiousness, then we will seldom confess to the Lord or forsake them. [We must be honest with ourselves.] This is the beginning. The problem is, that as people – simply, saved or unsaved, most often, we want to fool ourselves – to think better of ourselves than we really are. We are desperate to ignore our sinfulness. We do not want to own the depths of it. This, oddly enough is true even of Christians. We, who once we have been justified have the freedom to search our darkest depths without fear of condemnation would still rather turn a blind eye and be gentle with ourselves and our sin. We though, in Christ, can at last afford to be brutally honest and absolutely ruthless with our sin. For it is in bringing our sins into the full light of day, first to ourselves, and then to our merciful and gracious God, that in confession we find the means to forsake them. There is little that so erodes the sweet intimacy of Christ’s Spirit with our own souls as that of carrying around the weight of unconfessed sins upon our shoulders. Nor am I alluding to great and heinous sins, but that myriad of “little things” that grows most imperceptibly into a mountain of guilt and pain. As Protestants, we know full well that Christ is our great intercessor, and that we need no other man – no human “Priest” to fill that role. Christ has become our [“Great High Priest” as Heb. 4:14] calls Him. We are fully aware that we can come to the Father directly and without some invented, human intermediary. Yet I wonder how lax many of us become in the need for a consistent audience before God where we don’t fail to pour out the cache of sins and transgressions that we have tried to hide from our own eyes as well as from His? If God’s Word has ceased to speak to you; if the Spirit of God seems so distant and your own heart has grown cold and unmoved – it just may be that you have forgotten to come and make your confession of failure before Him, that nothing might hinder His nearness. Nothing kills intimacy more than dishonesty and secrecy. It is true in human relationships and especially true in our relationship with our God. Recall Adam and Eve immediately after they fell – hiding their sin and nakedness was their first instinct. The secrecy of sin is its power to bind. What is forced underground, hides and cannot be easily rooted out. The Writer here reminds us that breaking this secrecy is essential to [“prospering”] – which is nothing else than gaining victory over the motions of indwelling sin. The truth is, He is never far away, but our sin can cloud the reality and enjoyment of His loving presence. Beyond the obvious benefit of the clearing of the conscience and the relieving of the guilt designed to bring us back to the Cross, the confession of our sins regularly, fully, and graphically, prevents us from falling into false pride and a pretended self righteousness. It is a great preventative against an imagined spiritual superiority. No one who deals with their own sins before the throne of God candidly, thoroughly and regularly finds it easy to persecute others for theirs. In fact, it is almost certain that one has lost all touch with their own sinfulness when they take up stones to punish other sinners personally. Such gentleness issues from familiarity with and brokenness over your own sin first. Then you may be of use in recovering others. Until then, you will imagine yourself both judge, jury and all too often – executioner. Are you preoccupied with the sins and failings of others? I can guarantee you do not spend much time investigating, confessing and grieving over your own sins. This is not “penance” – it earns nothing, but DOES much! But there is a word in our text which draws us off to see a peculiar blessing attached to such confession that quite exceeds any guilty man’s hope. It is in that very last expression – [“compassion”] (NASB), or “mercy” in the ESV. I don’t know about you, but compassion is not what comes to my mind first when I think of the way that God deals with me concerning the sins I bring before Him. It is one thing to say that in coming, the Believer might be pleased to know that he will find forgiveness with God on behalf of Christ. But our familiarity with the way men forgive can find us thinking that God’s forgiveness is a grudging one. Yes, we find mercy, but is there not a need to placate Him somehow as well? We wonder. Then, we might even venture to think beyond the mercy which withholds the punishment that is our due, and have faith to believe that He might even show us grace – unmerited favor – beyond mere mercy on Christ’s behalf as well. How the soul rejoices to be able take such comfort in those hours of grief for sin. But the Writer’s word here transcends grace and mercy both, and would have us fix upon a promise of compassion. (rāḥam). vb. have mercy, pity, show compassion. Refers to the act of being moved with compassion to show care or pity for another. It is one thing to hope for mercy, another to believe for grace, but what divine love is this, that when we sin in our filth against so holy a God as ours is – we come to expect compassion too? O is not His love for us beyond our finding out! Beloved, this is one of those divine mysteries that fills the soul with genuine wonder. Here is God’s Word to His people. So great is the change wrought in us by saving grace, that grief over sin – true grief for the commission of it, not for being caught in it – though not another human being know it, is a signal mark of regeneration. And it is to this that God our Father then comes and does not only forgive, does not only continue His blessing upon us, but in fact soothes the troubled conscience by His Spirit and the Word that we might be recovered from the very soul wounds we have inflicted upon ourselves. How can such a thing be? When He should rail against us in His just wrath – yet for Christ’s sake, He actually ministers unto us in the tenderest of compassions, that our sin might not swallow us up. Christian, if you would know mercy, if you would fully comprehend grace, then you must know that the Father’s forgiveness is not some grudging half dismissal still awaiting our ability to salve His holy anger and restore ourselves to Him. He has compassion on the pain we suffer for our own sins, and ministers to us according to the depths of His divine love. This, is past understanding. Let not another moment go by, where you are carrying about the load of unconfessed sin upon your back. Call to Him. Come to Him. Confess it all, turn from it all back to His loving arms, be free of it all, and know the compassion of His great love for you in Christ. Now the issue of “confession” raises questions about whom we might confess to, and under what circumstances. This is not a simple matter. Some things simply cannot profit others and thus are not fit for public consumption. In fact, too much said about shameful things to large, unprepared audiences can cause much positive harm. So it may be wise to look at this in terms of layers. The very first layer is that confession must begin with SELF. As we’ve already seen: God requires truth in the inward parts (Ps. 51:6). We must be absolutely honest with ourselves about our sin – facing it head on for what it really is, neither excusing nor soft-soaping it (nuancing our own conceptions by thinking of our own sin in therapeutic terms and without horror, disgust and the need to find freedom), not accommodating it or giving up on its need to be mastered. If we do not begin here, no true progress can be made. Here in fact, we may well appeal to God’s Spirit to open our eyes to our own sin and its depths – lest we rely only upon our own deceptive hearts. We WILL try to fool ourselves. Psalm 139:23 (ESV) Search me, O God, and know my heart! Try me and know my thoughts! The next layer is confession to God. If we cannot speak openly, truthfully, brutally to Him about our sins, then there is no help to be had. For it is only by walking in the Spirit that we can be prevented from gratifying the lusts of the flesh (Gal. 5:16). If we cannot honestly and fully enlist His help, there is no other source of help to be had. Whether or not a 3rd layer of confession to another Christian confidant or several, would seem to be dictated upon whether or not the first two have been utilized fully – and have dealt with the problem. If not, other measures are required. Appropriate brothers and/or sisters need to be brought into the situation to lend encouragement, accountability, advice, prayer and other support. It is my considered opinion however that failure to truly live in the first two, is most often what requires the implementation of the 3rd. You see, the Christian life never goes further than the Cross. It is there we stay. And if you are not a Believer today – how especially do you need to fully recognize, and confess your sins of unbelief and self-love and self-determination. To bring your rebellious heart to Him openly and fully and to find the compassion and forgiveness He offers – because of the remedy for sin made in the substitutionary death of Jesus at Calvary. And if you know you are not sensible of your own hardness against Him – to come confessing that – that He might have compassion on your lost and hardened state. Mercy and compassion await those who will own their sinfulness. And you will prosper in the most valuable way of all – being reconciled to your God and Creator in Jesus Christ. Heavenly Father, give me a heart that detects and acknowledges my sin fully and quickly. May there be nothing between us on any level. May my heart be open and honest before you, looking to you and depending upon you till at last, by your grace, those areas which at present remain untamed and defiant of Christ’s Lordship, are brought to their knees before you. R. J. Coates, “Sacraments,” ed. D. R. W. Wood et al., New Bible Dictionary (Leicester, England; Downers Grove, IL: InterVarsity Press, 1996), 1034. J. David Stark, “Forgiveness,” ed. Douglas Mangum et al., Lexham Theological Wordbook (Lexham Bible Reference Series; Bellingham, WA: Lexham Press, 2014). Elliot Ritzema, 300 Quotations for Preachers from the Early Church (Pastorum Series; Bellingham, WA: Lexham Press, 2013).